Sometimes you need a calendar that you can get your hands on. To show to your friends, colleagues…and boss. 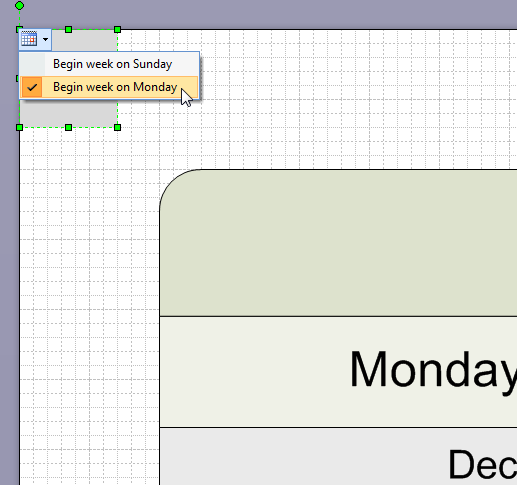 Visio has had calendar templates for sometime (which you should have a look at!) You might find them if you follow the menus to File > New > Schedule. The Month shape is pretty smart. It lets you pick the date for the calendar, and choose whether you want the week to start on Sunday or Monday. You can resize it as you please, add markers and notes to it, and even import calendar items from Outlook. There’s also a Year shape. It lets you create 12 months on a single page, all in one fell swoop. But these calendars are pretty small–more for reference than for marking-up. But sometimes you need a nice big, full-page calendar, and sometimes you need several months at a time. And to do that with the Calendar template, you’d have to create 12 pages, drop a calendar shape on each one, and configure each one (and put up with an irritating message that pops up every time you change the Month shape’s date!) This takes a bit of time, and I hate to think of thousands of you repeating the same bit of drudgery, over and over and over. 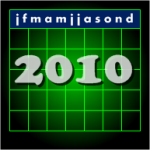 Pre-made: All Twelve Months of 2010! 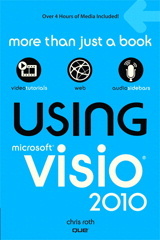 So the Visio Guy has delivered a late Christmas present and done all this work for you. 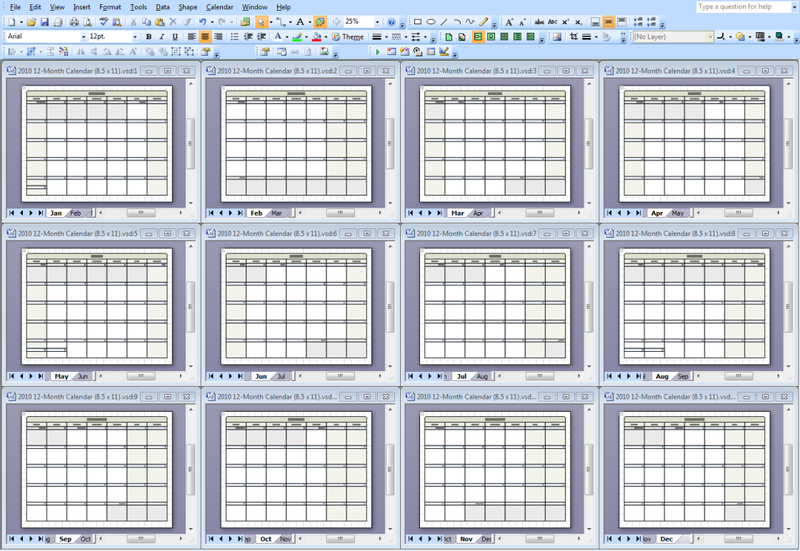 Here you can download a single file that contains twelve pages, one for each month of the year 2010! You can print out the whole year at once, or just select a few months for your quarterly planning. Wow, that’s a lot of tabs! And while we’re speaking of lots-0-pages, I thought I’d mention a neat way to navigate pages in Visio documents. No need to hold down Ctrl, Shift or Alt to get these babies to work! One last “smart” feature. You’ll notice a small, gray rectangle in the upper-left corner of each page. This rectangle holds a Smart Tag – a little icon that appears when you mouse-over the rectangle. If you click the icon, you’ll see two menu items that let you set the starting day of the week for the entire document. Yup, with one click, you can change all twelve calendars to begin the week on Sunday or Monday. Super easy! And don’t worry, this rectangle doesn’t print, so your documents will still be neat and tidy! Hi, please check A4 version. There is an error : you have 31. January on Sunday and additionally second one on Monday. All dates are shifted one day which makes this calendar useless. BTW – thank you for great site. Thanks for finding the bug. I’ll try and take a look soon and fix it! I really appreciate user feedback for the downloads, so thanks again! I’ve checked the metric version. It is the same as the 8.5″ x 11″ version. Jan 31st, 2010 fell on a Sunday. Jan 31st 2011 will fall on a Monday. Both of my calendars show this. Where is the error?